Landlords who allow pets may want to consider replacing carpeting in rental units with a flooring material that is easier to clean and maintain. If a tenant wants rugs, they can purchase them, and deal with the problem of repetitive urine spills on their own dime – pay to clean the rug, or throw it out. Either way, it’s not the landlord’s problem anymore. 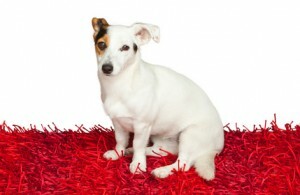 Pet deposits are usually nothing more than an additional damage deposit. The separate “pet” portion arises because in the states that restrict the amount a landlord can collect for a damage deposit, a landlord often is allowed to collect a bit more if they agree to let the tenant have a pet. If your property is in a state which does not limit the amount a landlord can charge for a general security deposit, it may be easier to simply charge a higher security deposit, and avoid this problem of interpretation. Where funds designated as a “pet deposit” generally can only be applied towards pet damage, we are aware of no rule that prohibits a landlord from deducting the remainder of the pet damage from the general security deposit, and if that’s not enough to cover damages, to collect the rest from the tenant in court. But sometimes the lease agreement limits a landlord’s rights in this situation, or may not make it clear what those rights are. Does the lease state that the tenant will be liable for all damage, regardless of whether it is caused by them or their pet? Did the landlord reserve the right to deduct pet damage from either source, or does the tenant have the impression that the pet damage will only come from the pet deposit? If the pet policy and security deposit provisions are not clear, a landlord may still have a fight on their hands, even if they do ultimately win the argument. Whether damages are deducted from one deposit or both, the landlord is still required to prove that the tenant (or their pet) caused the damage, and that the expenses goes beyond normal wear and tear. Additionally, the amount deducted must be an actual – and necessary, cost. It may be beneficial to include a pet policy in the lease for each tenant, even the ones who don’t have a pet now – in case they get one later on. Alternatively, implement a strict “no-pets” policy, and enforce it. Make sure the landlord has the right to “evict” the pet if it becomes disruptive, but don’t agree to give back the pet deposit until the lease termination. Don’t use the word “fee” if you mean “deposit”. Avoid placing too much money in the “pet” portion of the deposit – the pet may be better behaved than the tenant.